Uncover the tragic events inside Frostflow Lighthouse. What happened in Frostflow Lighthouse? Investigate the lighthouse living areas and read the family's journals. Retrieve the cellar key from the burial urn on the mantle. Search for the remaining family members in Frostflow Abyss. Take Habd's remains to the lighthouse brazier. On the snowy tundra between Winterhold and Dawnstar stands Frostflow Lighthouse, a remote building overlooking the Sea of Ghosts. 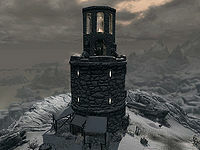 It has been abandoned until recently, when a Redguard couple, Habd and Ramati, finally managed to realize their dream of purchasing it, planning to spend their silver years in the lighthouse. The couple brought their two grown children, Sudi and Mani, hoping that eventually they'd decide to stay with their parents. Both children hated the place, but the parents kept hoping they would just stay in the lighthouse for a few years before venturing out into the world on their own. As you approach the lighthouse, a dead horse will block your path, hinting that something went terribly wrong inside. As you enter you will be met with the sight of a dead body lying in the center of the main chamber. 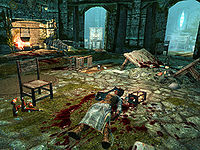 A broken table and the bloodstained remains of a chaurus, primitively killed with a woodcutter's axe, are near the fireplace. The quest will immediately initiate and some strange scratching noises will appear from somewhere below. 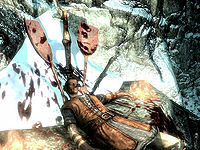 The dead body turns out to be the mother of the family, Ramati, impaled by a Falmer war axe. She carries her husband's journal; read through it and you will discover what happened to Ramati and how Habd managed to kill the chaurus before venturing into the cellar for his children. Oh gods poor Ramati. It must have come out of the cellar. I'm going down there and locking the door behind me to make sure they don't escape. I don't know if I'll make it out, but I have to save my family! From Habd's journal, it is clear that the intruders are located downstairs, but the cellar door is locked, so ignore the scratching sounds and investigate a bit further. Start in the northeastern bedroom where Habd and Ramati's double bed is positioned in the center of the room. On the end table sits Ramati's journal so read through it for some more observations and a few clues. Head into the neighboring room to the northwest, belonging to Mani and Sudi, and follow the trail of blood to Mani's bed. Underneath the bed is a knapsack with a letter where he claims not to be responsible for the odd noises coming from the basement, and how he will leave the lighthouse as soon as Habd returns from his venture into town. On a table in the same room is Sudi's journal. Read through the last section of the journal and compare it to the last section of Ramati's journal, and you will know where the cellar key is hidden. Head to the fireplace and investigate the burial urn sitting on the mantle. It contains the cellar key so grab it and loot the lighthouse for valuables, including a copy of the Restoration skill book Mystery of Talara, v2 in the parents' bedroom. Finally approach the cellar door and prepare for a very long trek into the depths beneath the lighthouse, where you will find out what happened to the other family members, Sudi, Mani, and Habd. Head down the stairs and avoid the bear traps laid out by Habd in an attempt to stop the supposed skeevers. Follow the trail of blood down to a snowy chamber where two chaurus will attack, effectively solving the mystery of the scratching sounds. Dispose of them both and keep an eye on the blood in the snow. Halfway through the room, the trail stops, and in front of you is a knocked-over set of shelves. Where the shelves used to stand is a huge hole in the stone wall. Proceed into the tunnel behind the wall and enter Frostflow Abyss. I don't know how long we've been down here. Father came down to find us, but those things captured him as well. I asked him if he'd seen Mother or Mani, but I don't know if he could even hear me. One of those big bugs bit him when he tried to get free and now he's feverish. Head down the slope and discover the recognizable tents usually inhabited by the Falmer. Before long, a Falmer will attack, along with another chaurus. The trail of blood starts again here, leading towards a plateau between the tents. Here, you can find the remains of Mani, skewered by a Falmer sword and roasting on two fires, obviously on his way to become the meal for the inhabitants of the crypt. Locate the gate to the southeast and head up the slope for another battle against a Falmer and a chaurus. Take the narrow tunnel to the southeast and beware the tripwire triggering the slicer in the ceiling. 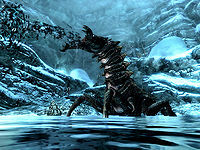 Before long you will land in a nest filled with cobwebs and inhabited by a Falmer and two frostbite spiders. 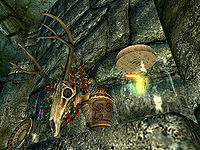 Kill them all and proceed through the southwestern tunnel until you reach another chamber, divided into two levels, with a patrolling Falmer on the ledge above, and another on the ground. Fight them both and investigate the cage along the western wall. In there, you will find Sudi lying dead in a pool of her own blood. A scrawled page is nearby, detailing how far her father managed to get into the cave before he was finally overpowered by the poisonous inhabitants. Sadly, a bloodstained note in her hand explains how she was able to commit suicide before she suffered the same fate as her father, explaining the blood and the iron dagger sticking out of her wrist. They took Father. There had been some others they brought down but they led them off and all we heard were the screams and now Father is gone too. I don't know where he was hiding it, but I think I know why he left me this dagger. Locate the slope to the southeast and proceed to the area above and fight any remaining Falmer. The only available path is located to the west and marks a point of no return, as you will be unable to get back up. When you drop down, kill the chaurus and examine the Falmer tent for a couple of useful healing potions. Then head forward through the tunnel until you reach yet another point of no return, a large chamber filled with several chaurus enemies, spitting poison at you while you slowly climb down to the bottom using the stones sticking out of the wall. The room is flooded with water and all of the walls are covered in egg sacks filled with chaurus eggs. A total of four chaurus will attack. Kill them and proceed through the tunnel to the northwest until you find yourself in another huge chamber filled with eggs and more chaurus. Locate another slope and another narrow tunnel in the northeastern corner, leading to even more egg sacks, more chaurus, and more fights. As the amount of egg sacks slowly increases and covers the surroundings, prepare for the final battle in the northeastern chamber where a huge chaurus reaper resides, sitting on an island surrounded by egg sacks. Pick the fight with the giant chaurus and keep an eye on your health at all times, as several smaller chaurus will join their leader. Once the reaper is dead, the quest will end, although you still haven't found the head of the family, Habd. Open up the chaurus reaper and you will find Habd's remains inside, along with his lighthouse key. Claim the key and the remains, head up the slope and loot the boss-leveled Falmer chest, then head through the narrow northeastern tunnel until you fall down in the very first chamber of the crypt. I know they think their father will live forever, but I see his age creeping into his eyes. He made me promise again that when he died I would put his bones in the lighthouse fire so he could look out over the ocean forever. Head northwest and you will be back in Frostflow Lighthouse, with only one thing to do for the family of Redguards, namely to follow Habd's last wishes, as written in his wife's journal. Unlock the wooden door adjacent to the cellar door and travel all the way up to a ladder that leads to the very top of the lighthouse, with the impressive view described by Sudi in her journal. 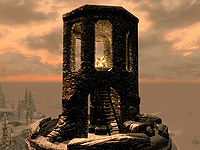 Habd's key will unlock the chest up there, so claim another reward and then head up the wooden ladder to the lighthouse brazier and activate it. Habd's remains will then be placed in the brazier, fulfilling his last wishes, to look out over the ocean forever. This gesture earns you the Sailor's Repose, a permanent effect causing all healing spells to cure 10% more. If you practice Alchemy, the Frostflow Abyss is an incredible source of Chaurus Eggs, with 525 guaranteed samples (516 from egg sacs and 9 hand-placed). As well as Glowing Mushrooms, with 96 guaranteed samples. Using the Animal Allegiance shout makes this quest incredibly easy to complete since it will cause every chaurus in range (including chaurus reapers) to become harmless and attack other chaurus that remain hostile to you. Any chaurus under the effect of Animal Allegiance can also easily be killed with sneak attacks. If you clear Frostflow Abyss before the quest is started, you won't be able to actually finish the quest. Using the console and typing setstage dunFrostflowAbyssQST 90 may complete this quest and remove it from your Miscellaneous Quests. On approaching the lighthouse, some followers may refer to it as a cave, saying "Hmm. Caves. Wonder what's below." Followers won't go past chaurus gates in the cave. Bumping them (running into them to push them in a direction) or the Unrelenting Force shout to push them past the gates works. The following empty quest stages were omitted from the table: 0, 7, 10, 20, 21, 22, 90, 95. On the PC, it is possible to use the console to advance through the quest by entering setstage dunFrostflowAbyssQST stage, where stage is the number of the stage you wish to complete. It is not possible to un-complete (i.e. go back) quest stages, but it is possible to clear all stages of the quest using resetquest dunFrostflowAbyssQST. This page was last modified on 29 July 2018, at 20:51.